The day finally cleared and turned warm enough for Kaylee, who was staying with us over the Memorial Day weekend, to go swimming. She had endured the impatient wait during the cool morning by playing our X-Box games and watching kids shows on TV. All during the morning we witnessed the mass migration of RVs leaving the Boston/Minuteman Campground here in Littleton, Massachusetts as the RV park emptied out as a rain fell leaving just a few of us mostly retired full-timers. On the way back from the pool Kaylee and I passed a couple and we said "Hey". It took awhile for my mind to untrack and the memory cells to get my attention and tell me, "That couple looked somewhat familiar." I looked back at them and scratched my beard and wondered if they really were who I thought they were. The couple was now in the distance and had their backs to me then they turned down a trail and I lost sight of them. I went inside to drop off a still dripping granddaughter and gather up the dogs for their afternoon constitutional. I took the time to mention to Joanie that I thought I saw someone I knew but it was hard to tell because they were wearing sunglasses and had white hair. The dogs and I had to wait a bit as Kaylee wanted to walk the dogs with me and had to get her wet swim suit off and put on dry clothes. Finally out the door we again encountered the couple from before. I blurted out, "Jerry Herritage!" The couple turned to look at me. It was indeed old friends from Wilmington, NC. - Beth and Jerry Herritage. We had kept in touch with the Herritages over the internet and knew that they, too, were RVers and traveled extensively but they mostly traversed the West and I never had any inkling that they would show up here in the Northeast. It turns out that they are in this campground because they had read about it on this blog when we were here almost a year ago and wanted to be near their daughter for the birth of their first grandchild who is, as of today, overdue. 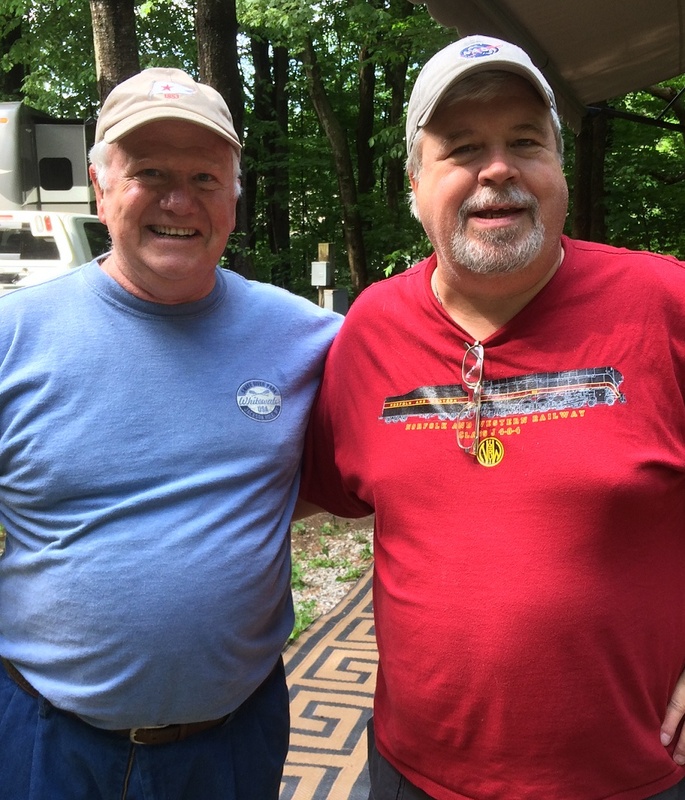 We hope to get together soon and rehash old times and tell RVing stories over a chilled adult beverage. But today is our oldest son's birthday and we have plans to celebrate! I still can't get over the seemingly random meanderings of our Phaeth and the Herritage's Airstream would ever be this close. Who'd a thunk! Just love the Godincidences of life.